Away from the main exhibit of the Chicago Architecture Biennial—the country’s biggest architecture festival, on show through January 2018—there are a half-dozen smaller “anchor” shows, hosted by neighborhood arts organizations far from downtown. These reveal a different side to Chicago’s architectural legacy, famed for the White City of 1893, Frank Lloyd Wright, and the rational Modernism of Mies van der Rohe. In a segregated city, these exhibits make the case that other neighborhoods and traditions matter, and ask critical questions about cultural ownership in the midst of market-abetted change. Chicago: a Southern Exposure is the most direct about angling for a new swath of architecture to be added to Chicago’s A-list. Made up of photographer (and native South Sider) Lee Bey’s photographs of the South Side, the small exhibition at The DuSable Museum of African American History showcases this part of the city’s rich architectural diversity. The sawtooth facade of Eero Saarinen's D'Angelo Law Library shines with crystalline perfection, and the sloped triangular roof of Pride Cleaners makes for a ready-made neighborhood icon. Pride Cleaners (1959), at East 79th Street and St. Lawrence Avenue, designed by Gerald Siegwart. 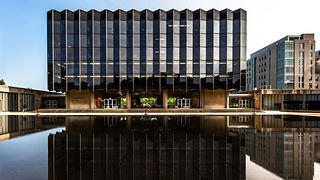 D’Angelo Law Library (1959), designed by Eero Saarinen, on the University of Chicago campus. The buildings are, with a few exceptions, photographed in a pristine, heroic way, with few people and imposing framing. Bey says he took this approach, in part, to strip away the cultural context and geographic baggage that the South Side carries with it, so that they can shine purely as architecture. There’s a public image of the South Side as a monolithic wall of black poverty. 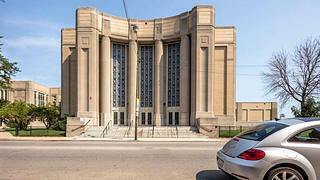 By giving these buildings the magazine-cover treatment, Bey wants viewers to register that the decay they may have expected to see isn’t always there, and to realize that the South Side’s architecture can hold up its end of the bargain. His photographic approach “wants to reach into your brain and take [racism and classism] out, and it wants you to see me doing it,” says Bey, who was recently hired by the DuSable as vice president of planning, education, and museum experience. 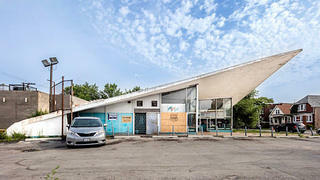 From showstoppers like Mies van der Rohe’s Illinois Institute of Technology campus to quiet wonders like the Chatham neighborhood’s stock of Mid-Century Modern homes, Bey says the South Side has no rivals in Chicago architecture outside of downtown. “Almost any portion of a South Side neighborhood can yield 30 pieces of architecture that could rival what’s on [the museum’s] walls,” he says. Chicago Vocational High School (1941), at 2100 East 87th Street. Dr. E.J. 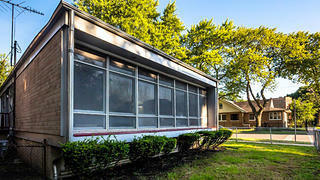 Ingram House (1959), 6500 South Eberhart Avenue, designed by Roger Margerum. The National Museum of Puerto Rican Arts and Culture offers an exhibit that is pure sepia-toned history. Its two-part show focuses on a widely beloved Chicago landscape, Jens Jensen’s Humboldt Park, and attaches it to the social and cultural history of its respective namesake neighborhood, home to immigrants from many nations. The other half of the exhibit traces the history of the ethnic groups that have left their imprint on Humboldt Park since the 1890s. Along the way you find Polish monuments, Swedish churches, Norwegian hospitals, and Puerto Rican schools and cultural centers—which became the dominant cultural flavor in the area from the mid-20th century. “It shows a little bit of everyone,” says Bianca Ortiz Declet, the museum’s director of exhibitions and education programming. Ortiz Declet was fascinated by how these “different communities fuse together” around the park. But photos of the 1966 Division Street Riots make stark the frictions and inequities that persisted. Ignited when police shot a 20-year-old Puerto Rican man just after the city’s first Puerto Rican Day Parade, it was the first major Puerto Rican uprising in the country. The National Museum of Mexican Art’s Placemaking and Landmarks: The Creation of Mexican Spaces in Chicago, is decidedly not an assimilation story. In mainly period photographs, it speaks of cultural solidarity through forced migration. It’s a story of “how the city is malleable, and how the character of specific neighborhoods can transform,” says the museum’s Chief Curator Cesareo Moreno. Chicago’s first Mexican community was located just west of downtown, near social crusader Jane Addams’ Hull House. But during the 1950s and ’60s, the city uprooted much of this area to install a freeway and the University of Illinois-Chicago, displacing 9,000 Mexicans. Many of them resettled a half-mile to the south, in the Pilsen neighborhood. 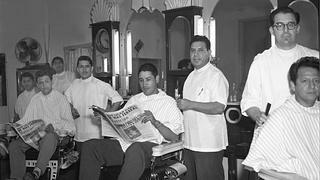 Fernando Estrella (center) in his barbershop, c. 1957. 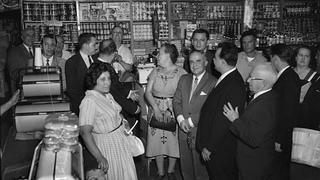 Casa Estaydo grocery store at 1138 South Halsted in 1957. Photos of street vendors, church services, barbershops, and local printing presses trace a trajectory common to immigrant neighborhoods. First are the fundamental units of social infrastructure, like churches, and then come commercial interests like shops and businesses. Finally, there are civic institutions that require collaboration with the majority-run administrative state. This informal process of Mexican Chicagoans making space theirs happened with the installation of tortilla bakeries that shipped products all over the country and radio stations where the local priest said mass on Sunday. For the residents of Pilsen and any first-generation immigrant community, “placemaking” wasn’t something you hired expensive consultants to do. As such, there is little reference in the exhibition to architecture that’s not attached to people using it. “We wanted people to be the main character within the landscape,” says Moreno. If the show explains how Pilsen became Mexican, there’s already another question hovering over it. “In the back of everybody’s mind is, ‘What is it becoming now?’” Moreno says. In Pilsen, as in Humboldt Park, gentrification concerns abound. And the signifiers of immigrant culture on display (like the neighborhood’s murals)—the result of this steady, informal placingmaking process—become beacons of “authenticity” that lure affluent newcomers. The approval of cultural gatekeepers can help preserve buildings and thus might mean that gentrification is the price for admission into Chicago’s architectural canon. But it’s trickier when it comes to the people who gave those buildings life. Have a story idea that might be interesting and engaging for a national audience? Read our Contributor Guidelines and email us at editorial@savingplaces.org.